These books, two of which are co-authored with his wife and partner, Sedena Cappannelli, provide highly relevant, clear and empowering content for individuals and organizations committed to achieving high levels of performance. "George and Sedena Cappannelli remind us that our fear of and resistance to change, like our resistance to so many things blocks our ability to experience and express our natural inheritance. Their practical insights and experience opens the door for the reader to have a positive experience of change leading to oneness." In this complex and rapidly changing world, it is no longer a question of if we will change, but how. 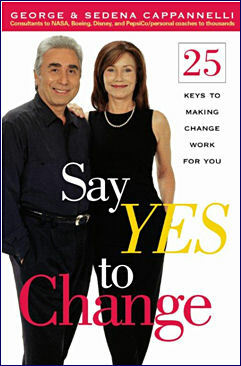 In Say Yes to Change, George and Sedena Cappannelli, two of the country's leading corporate consultants and executive and personal coaches, take an in -depth look at "how." They identify a number of ways to experience change as a doorway to new opportunities and increased levels of success. They detail the importance of embracing change, of learning to treat it as an ally rather than an adversary. One of the book's principle messages is that change does not have to be overwhelming. Nor do we have to lose touch with our sense of humanity or our connection with our loved ones. Instead, change can be experienced as an opportunity to learn, grow and live a more empowered, joyful and successful life. The book also explores the fact that although change is unavoidable, our experience of change is as varied as the beliefs we hold and the behaviors we practice. In short, according to George & Sedena Cappannelli, our ability to change is dependant on our willingness to identify some of these old beliefs and alter some of the habitual behaviors that cause resistance and result in missed opportunities. "Authenticity is a thought-provoking journey into the real art of leadership and I recommend it to anyone aspiring to positively influence others and to empower their own lives. It is a unique resource for identifying integrity at the most basic level – the level at which one finds one's meaning and purpose in life." A book for individuals who want to refine or rediscover their sense of meaning and purpose and who want to focus that meaning and purpose in achieving real productivity, outstanding levels of performance and a genuine sense of satisfaction. 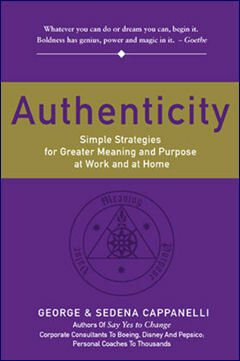 You are going to love Authenticity! In this world of deadlines and demands, of complex issues and financial pressures, of increasing competition and dramatic technological advances it is easy lose sight of what is truly important and to get trapped in doing what we think we have to do or in what we think is right rather than do the right things. As a result many individuals miss what they are really here to do and many organizations miss the opportunity to be truly successful. Authenticity helps organizations and individuals get back on track by re-examine some basic beliefs and habits that may be limiting their effectiveness and then it helps them to rediscover what they can do to minimize obstacles and maximize their opportunities. "If you want relevant, practical information and tools that can start making a real different in your organizations performance and productivity today, this is it!" If you manage people, want to clarify your own or your company’s vision, build a better team or stronger private practice; if you want to take your company or your life to the next level of success and effectiveness, this book can assist you to improve your performance and that of your organization by between 10% and 25%. Let’s face it! In today’s highly competitive business climate our success depends not just on what we already know and do, but on our willingness to learn new competencies and practice new skills. It is the only way I have found that we can keep pace with change, reduce our obstacles and maximize our opportunities. This book and the programs that are presented based upon it have been well tested by some of the best companies in the world and they can help you and your organization achieve the levels of performance and productivity you desire. "A must read for everyone interested in an immediate solution to our energy crisis." In these are challenging times one of the primary causes of our nation’s economic, ecological and geo-political instability is our dependence on foreign oil as our primary transportation fuel. This dependence, finally admitted at the highest levels of government and discussed with greater understanding and frequency in the general public debate, negatively impacts our individual lives on a daily basis by warming and dirtying our planet, draining our economy of much needed dollars and bringing us ever closer to more international conflict as the demand for oil moves toward a time when it will exceed its supply. 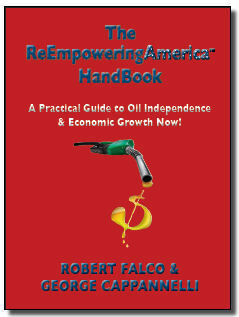 This handbook explodes a number of false assumptions and misunderstandings about alternative energy and presents a genuine, practical, achievable and cost-effective way, using available technology and resources, for our nation to significantly reduce and then eliminate our dependence on foreign oil within a decade. In fact, the information presented in these pages will allow our nation to actually start on this goal today and accomplish it within 10 years. 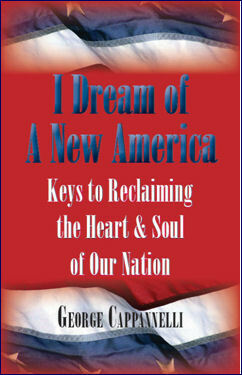 "Whether you are a Democrat, a Republican, an independent or someone who has withdrawn completely from the fray; if you are tired of the stalemate in Washington and still interested in the well being of America, this book has some thoughtful recommendations and very intriguing ideas." It is clearly time for a change! So if you are disturbed by the dysfunction and disharmony present within this nation; if you are disheartened and disappointed by the lack of effective and intelligent action being taken by our leaders and, of particular concern, by the absence of competence and consciousness they demonstrate, you will find the thought provoking ideas and practical recommendations presented in this new book of genuine interest. 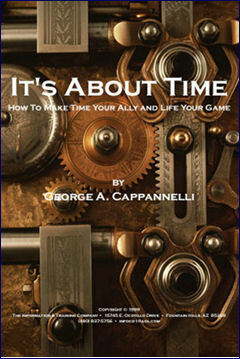 George Cappannelli is not only a well-known corporate and coach to some of leading organizations, government agencies and the people who lead them, but he is a very effective political consultant. He believes it is time that you, he and millions of other concerned citizens reclaim our sovereignty and renew the promises articulated in our Declaration of Independence, the U.S. Constitution and The Bill of Rights. He believes it is time we end this rapid and precipitous decline toward the end of a noble dream and once again set this ship of state on a heading toward a proud and positive future; it is time to initiate the next and necessary stage of The American Revolution.